It started out as "cabin fever", and turned into a skills refresher. After weeks of intermittent rain, I just had to take advantage of a few clear days in a row. It was mid-week so I went solo from the Echo Lake Sno-Park (not the one at Echo Summit, but rather the one formally called the Johnson Pass Sno-Park, which is at the start of the un-plowed Echo Lakes Road). There was about 3' of snow on the ground here at 7000', not bad considering how warm the storms had been. Overnight temps were in the high 20s. Starting around 7am, I walked up the groomed road to the end of Ralston's east ridge (more precisely the east ridge of Becker at this point), and plowed uphill in heavy powder. As I had hoped, the trees were loaded with snow. Even the power lines were 4-6" diameter, and power crews were out the next day replacing lines the storm had brought down from the weight of the snow that stuck to them. Very cool. Cold, actually, when a tree avalanche caught you. 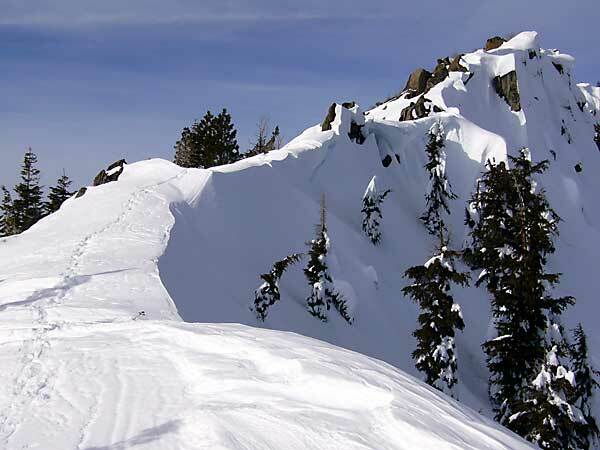 Becker Peak(8300') is as far as any old tracks went. It's a nice rocky outlook from which you could look down on Lower Echo Lake (not completely frozen, in January!) and the solid fog bank that hid Lake Tahoe all day. 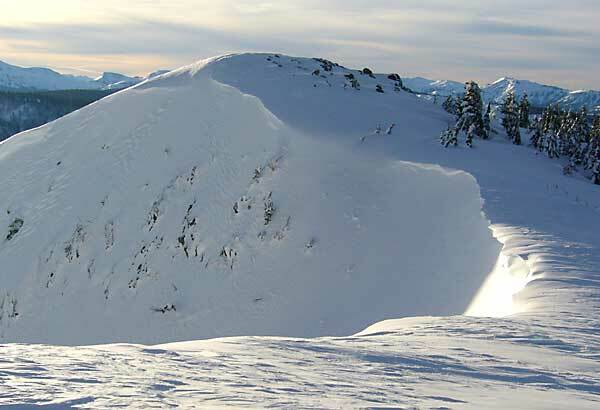 I stayed right on the ridge, just south of the overhanging cornices, all the way to Talking Mountain (8824'). By this point the dead calm of the lower trees had given way to a brisk wind, and the snow piled on branches of tall trees had given way to snow plastered on the trunks of the much shorter trees near the ridge. 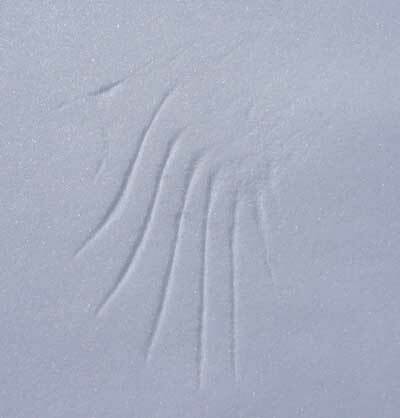 A grouse flushed out from under an iced tree, and left wing prints like these as it struggled to get airborne. Beyond Talking Mtn, the ridge was hard to stay on. The wind had sculpted the snow, gouging 5' trenches I had to go up and down. One side would be frictionless packed powder, the other side would be ice or breakable crust. Between the fluting and the trees and the rocks, I did a lot of up-and-down, but stayed as close to the ridge as possible. Somewhere near Saucer Lake the wind got to the point I staggered occasionally. By the time I was near Cup Lake I was leaning into it and really focused on not being blown over the edge. Probably 30-40mph. My little exercise and sightseeting trip had turned into real climbing! The ridge east of Point 9155 was blown free of snow, but the talus and boulders were packed with rime ice so I had to drop off the south side of the ridge and traverse. The surface snow was getting sticky, and there was ice a few inches down, so I switched from snowshoes to crampons. When they started to ball up and the slope got too steep, I ended up facing the slope and kicking steps back up to the ridge. It's been a while since I picked and kicked with a full pack! On the ridge again, at Point 9155, the surface ice was clear and thick enough that my crampons would not penetrate it. Water ice? Here? I stayed in crampons all the way to Ralston Peak (9235'), which I reached at about 3pm. I had been taking reasonable breaks, but carrying a full pack to the summit had taken its toll. As mentioned in other reports, the ridge was heavily corniced west of Cup Lake. About 100' from the summit (not 100' down, 100' sideways) I found a snow drift behind a clump of iced trees and dug my first ever full-blown snow cave. Normally I dig a trench and pull a tarp over it for winter camping, but with the wind still howling I figured the tarp wouldn't last long. As expected, it took almost 2 hours to carve an 8x4x3' hole in that drift. As with a well-designed igloo, the entrance was slightly lower to reduce drafts and trap heat. It worked! Outside it dropped into the low 20s and the wind never let up. Inside it was strangely quiet, and stayed at 34 degrees all night long. I went out for sunset and sunrise, and not much else.